Today we’ll take a brief look at some mortgage rate history to gain a little context. It’s always helpful to know what came before so you can better guess what might come after. 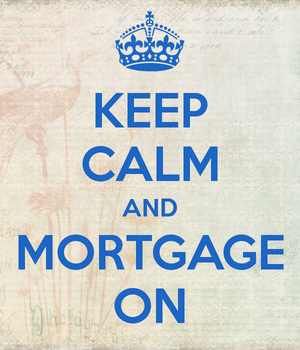 Just about everyone knows that mortgage rates hit all-time record lows over the past year. But do you know what mortgage rates were like in the 1900s? The 30-year fixed averaged 3.31% during the week ending November 21, 2012, its lowest point in history. Later, the 15-year fixed hit the lowest point ever, sinking to 2.56% during the week ending May 2, 2013. Both figures above come from Freddie Mac’s Primary Mortgage Market Survey, which only dates back to 1971. For the record, back in April of 1971, the first month they began tracking 30-year fixed mortgage rates, the national average was 7.31%. It went as high as 18.45% in October 1981 and as low as 3.31% in November 2012. That’s quite a range. Note that the graph above charts rates based on their January average of each year, so it appears they don’t exceed 18%. 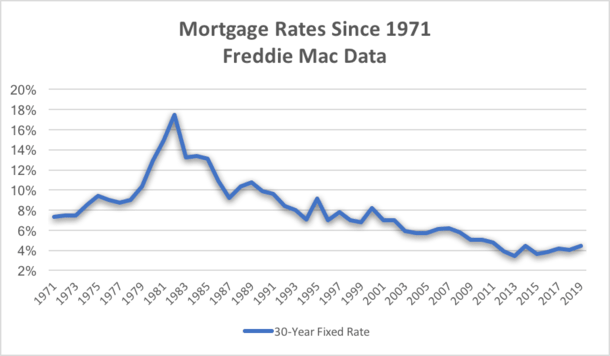 The 15-year fixed has only been tracked by Freddie Mac since September 1991, when rates averaged 8.69%. In that same month the 30-year fixed averaged 9.01%. Anyway, I remember a while back when fixed rates were in the low 4% range that the media was going on about how rates hadn’t been this low since the 1950s. I never really took the time to see how low rates were back then, but I finally decided to do some digging to get a little more information. That brought me to several out-of-print volumes from the National Bureau of Economic Research, which seems to have the best records out there. Unfortunately, the details are still quite murky at best. You see, back then there were different types of mortgages, not like the ones used today. While I don’t know when the very first 30-year fixed mortgage was created and issued (someone please tell me), they were believed to become widespread in the 1950s, which is why media references that decade. Before that time, it was common for entities like commercial banks and life insurance companies to issue short-term balloon mortgages, often with terms as short as three to five years, which would be continually refinanced and never paid off. These loans were also underwritten at LTV ratios around 50%, meaning it was pretty difficult to get a home loan. Later, once the Great Depression struck, home prices nosedived and scores of foreclosures flooded the housing market because no one could afford to make large payments on their mortgages, especially if they didn’t have jobs. Then came FDR’s New Deal, which included the Home Owners’ Loan Corporation (HOLC) and the National Housing Act of 1934, both of which aimed to make housing more affordable. The HOLC, established in 1933, could explain why long-term fixed-rate mortgages are in existence today. The purpose of the HOLC was to refinance those old balloon mortgages into long-term, fully amortized loans, with terms typically ranging from 20 to 25 years. A year later, the FHA and the Federal Savings and Loan Insurance Corporation were created, and in 1938, Fannie Mae was born. All of these entities essentially expanded credit availability and led to more liberal lending standards. 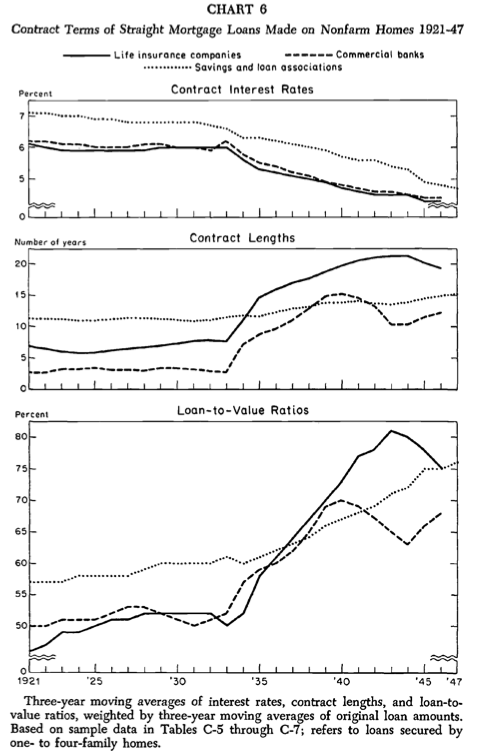 Over time, mortgage interest rates came down while LTV ratios and loan terms increased, as you can see from the charts below. 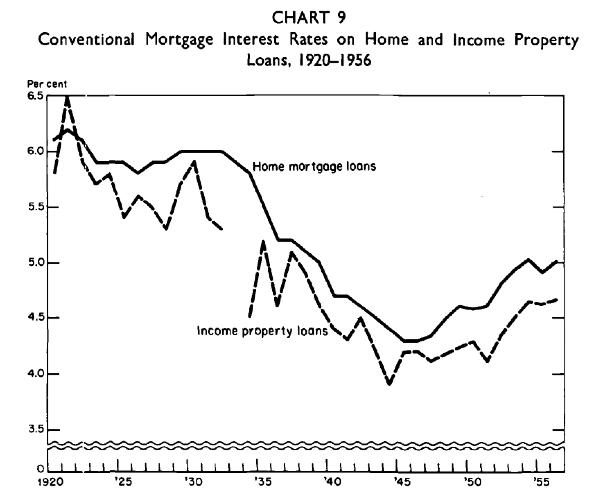 While it’s hard to get an apples-to-apples comparison of mortgage rates before the advent of the 30-year fixed, the National Bureau of Economic Research does have a chart detailing rates from 1920 to 1956. From about 1920 until 1934, conventional mortgage rates averaged close to 6%, and then began to decline to a low point of just under 4.5%. This is probably the reference point the media uses when they say rates haven’t been this low in 60 years. However, it’s unclear what types of mortgages these were over this extensive time period, and when the 30-year fixed actually became the standard. But it does provide for a little bit of context. Looks like rates have remained in a pretty tight range for the last 100 or so years. History also tells us they’ll probably gravitate back towards 6% eventually. Fascinating stuff! Too bad more of these old documents aren’t uncovered, I’d like to know more about the history of mortgages.